I thought it was just going to be another casual ramble up the Chief when Mark met me in Squamish on Sunday morning. The day before, we made plans to do some easy multi-pitch climbing to get back into the climbing season. I didn't really have an idea of what to climb. I had spent Friday evening climbing in the Smoke Bluffs. 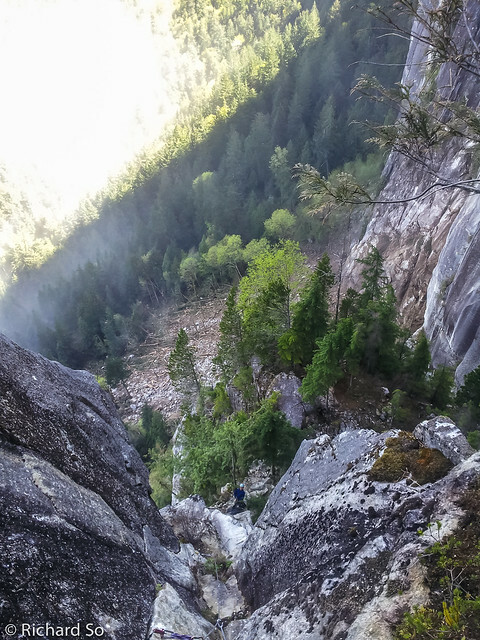 Saturday was an oddly productive day, starting with sport climbing at Chek, then climbing at Murrin Park, and then more climbing in the Smoke Bluffs and then capped off with a hot tub party. Mark suggested Angel's Crest. I thought it sounded good, and if we arrived at the base and there were slow parties ahead, we would just turn around and climb something else on the Apron. I think we parked on the Mamquam FSR shortly after 9am. There were a few cars in the Apron parking lot, but none here. A good sign. I was going to ask Mark to stop somewhere for breakfast since I hadn't eaten yet, but I figured I could suffice on jerky and cashews in order to get the climb before anybody else did. And I sneaked a grapefruit into the pack, to enjoy somewhere enroute. On the way up to the trail, we joked about my blog, and how I wouldn't be able to post any good conditions update after a ramble up this Squamish trade route. I think it was 9:30am by the time we were at the base and ready to go. 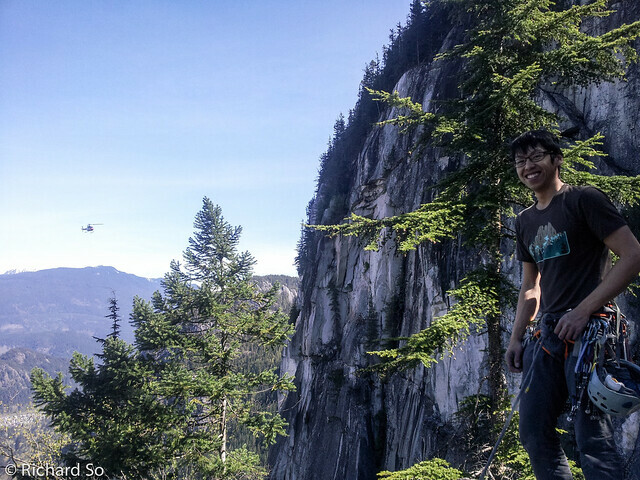 As I was climbing Pitch 1, a slabby 10b, I noticed some rocks falling through the forest at the base of the North Walls. At first, I thought it was somebody cleaning routes in that area. I've seen fixed lines in the area before, but thought it was strange for somebody to be cleaning routes on a busy Sunday, without any warning signs on the approach trail. Signs of instability were noticed as we continued up the route. The rockfall was intermittent, generally small blocks falling and rustling down through the tree. It was difficult to pinpoint the initiation zones, but I estimated that they were coming from a roof below Astro Ledge, rather than from higher up. I've seen rockfall here before, and the rock on the upper North Wall has been described as loose and expansive. At the top of Pitch 2, Angel Crack, I could hear a party of two above us, and saw a party of three reaching the top of Pitch 1. Mark took the next pitch, the 10b face, and linked it into the next easy Pitch 4. We caught up to the follower at the base of Pitch 5. I returned a booty nut that I found. Turns out all their gear belonged to a friend of theirs who lent it out to them for the day, and she was really happy to have the nut back. She offered to buy beer. I took this pitch, and linked it up with Pitch 6, where I passed the party of two. They had run of rope, and were nice enough to let us through. We hiked through the trees to the base of Pitch 7. Mark took this lead. While racking up at the base, I we were beginning to see bigger pieces fall off. The rock sizes were 0.5-1m at this point. Mark started climbing and placed a few pieces on the nice granite arete. At this point, we could hear much larger blocks falling off. We saw large table sized blocks tumbling. This was enough for both me and Mark to turn around and watch. And then it happened. 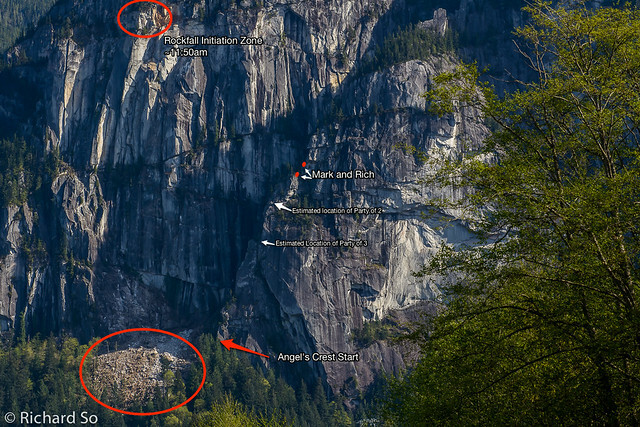 Annotated image that I took from Squamish after we finished climbing the route. From way higher up, a massive block, approximately 10-20m long released and fell out from the face. Just before that, I could see debris at the toe of the block ravelling off, sensing something big was about to happen. The sound was incredible. Anybody who has climbed Angel's Crest knows that the sound echos off across the North Gully and the North Walls. At first I saw the base of the block moving and dust clouds forming. I've watched more than my share of rock fall and landslide videos through school and work and for fun, but this was a first experience for me. It was hard to judge how close it was to me. The view of the mountains was momentarily blocked by the free-falling granodiorite. Unlike the small rocks falling earlier, there was no rotation, just one monster chunk of rock aimed straight down. I looked up and Mark, jaw-dropped and speechless. Once the block hit the forest below, a huge plume of rock dust engulfed the area below. The volume of rock is estimated at 1000-5000 cubic metres. I couldn't see the parties below at this point but hoped that they were ok.
Photo by Mark Lowson. Me watching the clouds below. From where I was, I couldn't see the knocked over trees. Photo by Mark Lowson. The rockfall scar is visible at the top. Photo by Mark Lowson. Looking back at Pitch 6, and the debris. Most of the North Wall is quite steep, especially the area around Alaska Highway. From what I can tell, some of block made contact with the lower angle toe to the left of Alaska Highway, and then broke up into millions of pieces while destroying mature timber in the process. We were too low to get a view of the damage in the forest, until higher up on Pitch 6. Our immediate thoughts were to send a text to Jen, Mark's wife, to let her know that everything was ok. The car was registered in Jen's name, and Mark knew the RCMP would call her soon. They would end up checking all the cars to make sure all the climbers were accounted for. Photo by Mark Lowson. We took a break at the Acrophobes Towers, and watched the helicopters fly by. Moments later, helicopters were in the air, circling the area. Sirens were going off and I could see ambulances parked at Apron turnoff. We were really hoping that nobody else was just getting ready to climb the route, racking up at the base as the rockfall happened. We got in contact with a SAR member standing at the top of High Plains Drifter, who asked us how many climbers were below us. We exchanged words, and said he would talk to us at the top. Instead of climbing the 5.8 chimney to finish, Mark led the 5.10c variation, a left-traversing finger crack. It's quite good, and a worthwhile alternative to the chimney. There were three pitons on the pitch, and the middle one was quite rusted and not trustworthy. I like the chimney, and now I can't decide which finish to do in the future. We topped out at 3pm, where the SAR team asked us a few questions while I ate my grapefruit. One of them confirmed that they could see five people in the forest below the Acrophobes. Phew. In this Gripped article, it mentions that both parties finished the route safety, and the lower party of three were hit by bits of debris. We walked down the trail back to the Apron parking lot, where there were still a few cars, and RCMP vehicles blocking the Mamquam Road. We explained our situation, and an officer shuttled us to Mark's car, our first trip in a police car. 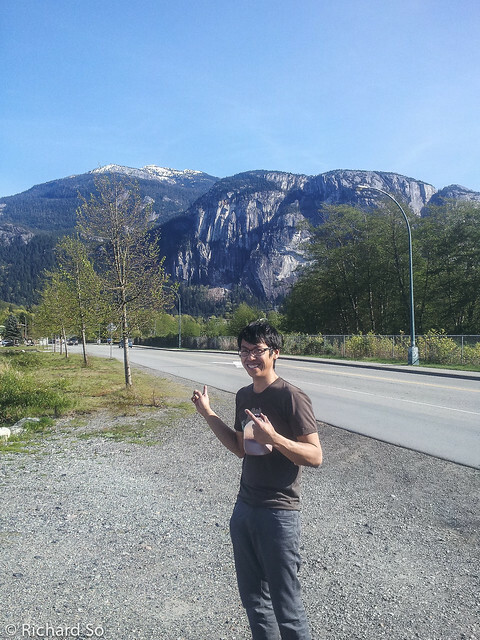 This was not what I was expecting when I headed up to Squamish on Friday evening. GlobalNews interviewed me the next day, and I have a few seconds of fame in the evening news segment on April 20 here. 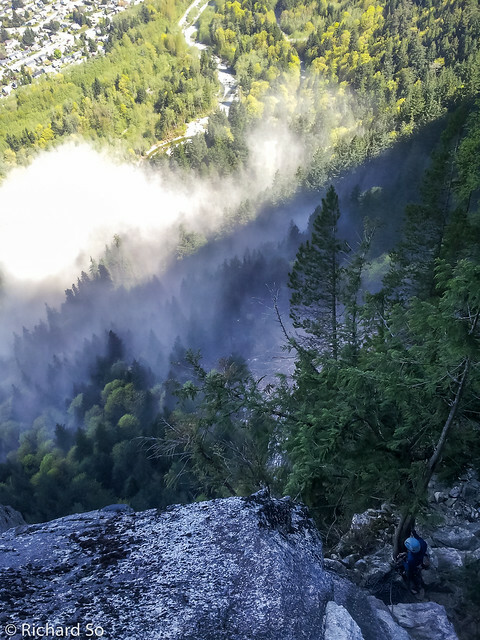 The Squamish rockfall story starts at 8:36. 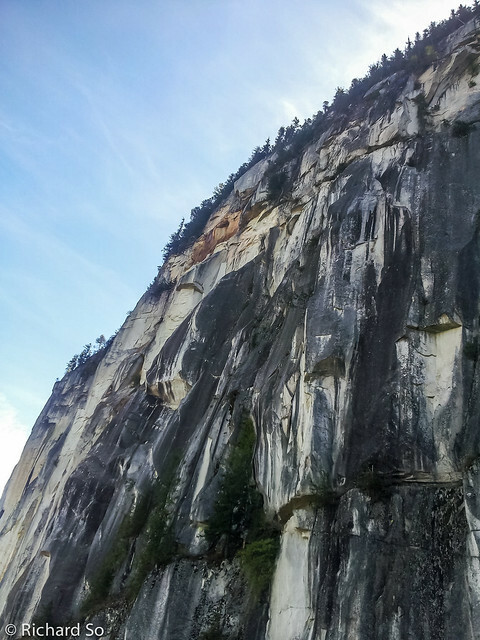 Awesome account of the rockfall Richard. So happy to hear you guys and all the other climbers are all accounted for. I guess new underwear are on the shopping list, eh? Cheers, Tami Knight, Vancouver. Note to self: Add Depends to the rack before climbing on the Crest or the North Walls again. Thanks Tami! Definitely getting some new underwear, and pants too. Great piece Rich! covered the happenings of the event so well, and the photos really help understand the scale of it! Love the annotated grand image. Hope you don't mind me sharing the link to this post and the images with people who might be interested? Still hard to believe you were right there and witnessed this firsthand, a great story for the grandkids!! Thanks Tristan! Definitely quite the experience. Feel free to share it, I think a link to it is already on a few climbing websites.